First established in 2007 by the Pacific Rivers Council, Salmon-Safe mission is to, “transform land management practices so Pacific salmon can thrive in West Coast watersheds”. The certification process takes into consideration the design, implementation, maintenance and operational practices for commercial, institutional, urban, industrial and agricultural lands. The Salmon Safe organization has grown and expanded to become a leader in fostering relationships and forging partnerships which elevate the way we work and maintain our landscapes and buildings so that we reduce harm to waterways and improve habitat for Salmon. Recently, DeSantis Landscapes partnered with Redside CRE in the design and remediation of the first ever Salmon Safe Light Industrial Park. Work will be completed over the next five years and will include water smart irrigation retro fits, lawn reduction or conversion to alternative lawns, stream bank restoration, and conversion of existing plant material to native and adaptive plantings. Work began with an overhaul of the front entrance of the property which had a traditional business park aesthetic with a large expansive lawn. Redside and DeSantis teamed up to create an environment which featured native and adaptive perennials shrubs and trees. By removing over 2,000 sqft of lawn, Redside took active steps to reduce the input of water, fertilizer, and herbicide required in a traditional lawn. 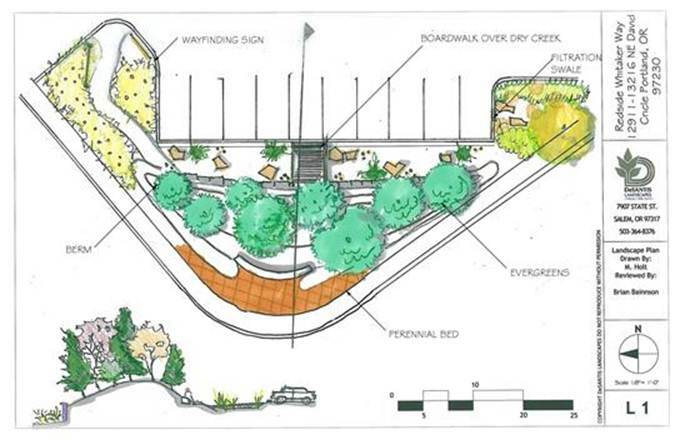 The design showcased how landscape can be converted from an energy intensive space to an environment which requires less input and improves the water quality of the Columbia slough watershed.